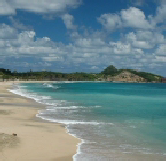 Grenada is a rolling, mountainous island, covered with fragrant spice trees and rare tropical flowers. Bordered by stunning beaches, and dotted with picturesque towns, this verdant island has long been a major source of nutmeg, cloves, ginger, cinnamon, and cocoa. The seductive scents drift through the colourful Saturday markets and Grenada's dense forests. In the interior of this volcanic island are cascading rivers and waterfalls, lush rainforests, and one of the most breathtakingly beautiful mountain lakes imaginable. 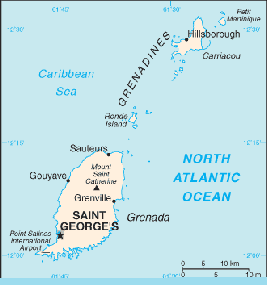 The capital, St. George's, is widely held to be the loveliest city in the Caribbean. The island is ringed with miles of picture-perfect strands, including both entrancing black and sugar-fine white sand beaches. And Grenada has plenty to offer those interested in offshore pleasure as well, with easily accessible and pristine reefs off the coast of both Grenada and its sister island, Carriacou. Information and photographs courtesy of the Grenada Board of Tourism and Geographia. For more detail on the island, those are great places to start. simple to luxurious. And, in the wake of Hurricane Ivan, the island is getting back on its feet again.